Dr. Loth’s SpineAlign Pillow was created to help back and side sleepers find a comfortable – and healthy – way to sleep. 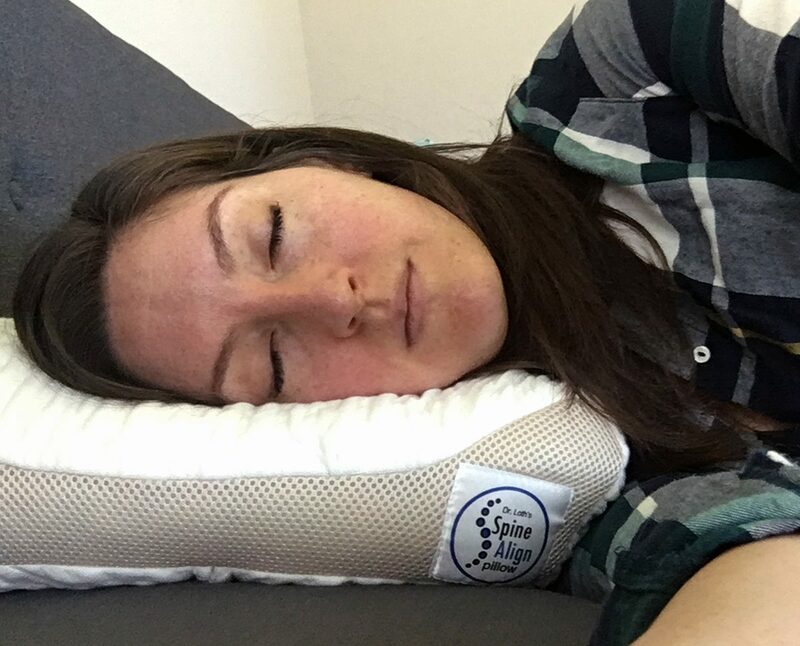 Could the contoured pillow work for you as well? With a little bit of patience it just might! Read on for my full review of the pillow. The full name of the SpineAlign Pillow is Dr. Loth’s SpineAlign® Pillow. It was created by Dr. Jason Loth, a sports chiropractor, with more than 17 years of experience in the field. Dr. Loth says he designed this cervical contour pillow because he couldn’t find a pillow that kept him in the correct head, neck and spinal posture both on his side and sleeping on his back. The filling is adjustable so it should work for a variety of body types and sizes. The pillow is uniquely designed as it tries to work as a “one size fits most” design. It has two outer chambers that are used for side sleeping. The middle of the pillow is flatter and more of a valley, made for back sleeping. The ends of the pillows are different sizes. 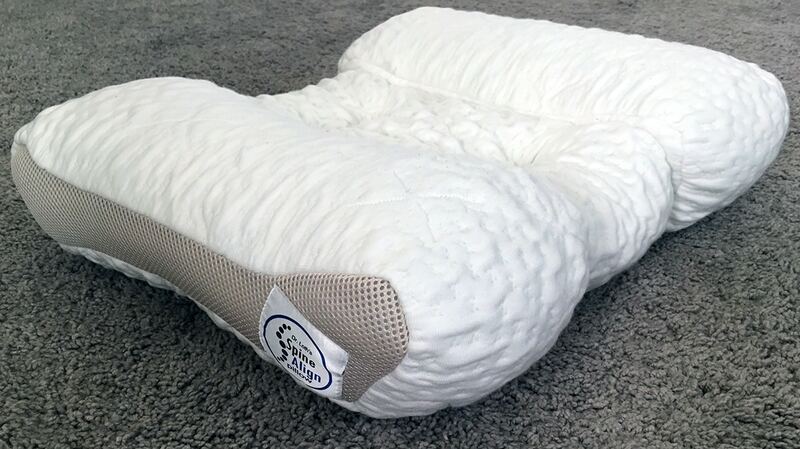 Those who are 5’ 7” or taller should rest on the side that features the SpineAlign pillow logo, while smaller individuals should use the side opposite the logo. The outer pillow is covered in a soft textured fabric made with Tencel (Lyocell) blended fabric with strips of mesh built-in the sides (specifics are 37% Lyocell, 61% Polyester, and 2% spandex). The bottom of the pillow features zippers around several pillow chambers. 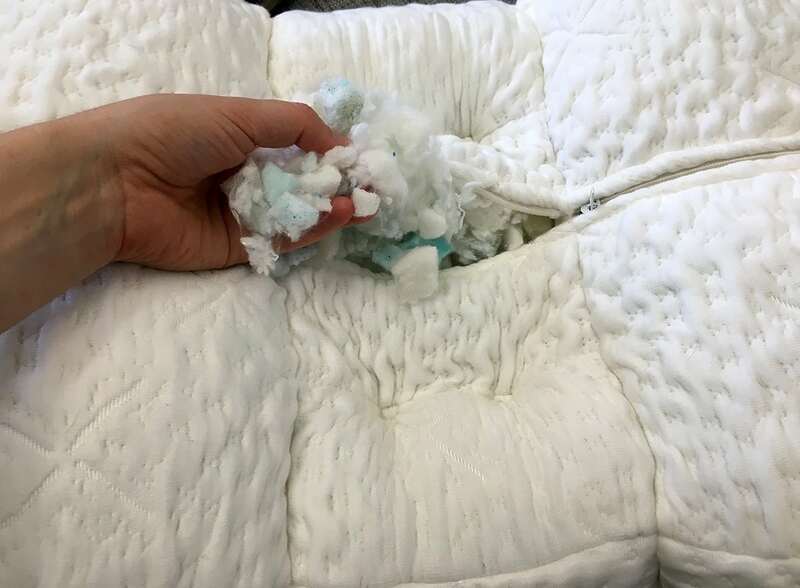 You can unzip the pillow to access the filling – which is a proprietary blend of fiber and foam. 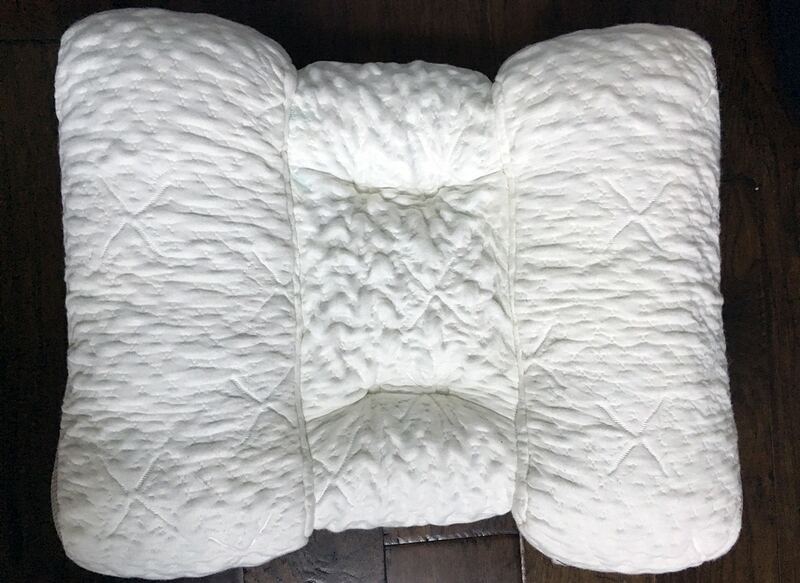 The pillow is adjustable, so you can remove and/or manipulate the filling to get the right loft and height so your neck, head, and spine are all neutral and aligned. For more information on how to set up your pillow, I highly recommend viewing the instructional videos on the SpineAlign website. The SpineAlign Pillow is focused on providing the proper sleep posture for both back and side sleepers. The pillow is as customizable as possible, trying to take into consideration that people have different head and neck sizes and overall body types. The pillow is raised slightly higher on one end than the other, so one of the first things I did when I got the pillow was to determine which side I should sleep on. There are mesh panels on the side of the pillow and one of them features a SpineAlign logo sewn into the fabric. That side of the pillow is designed for those 5’ 7” and taller (but this is not a hard or fast rule). I just so happen to be 5’ 7.5” so I faced that end of the pillow closest to my neck. In order to get all of the benefits of the pillow, you will need to take your time adjusting the filling levels and manipulating it until you can see that your head and neck are in a neutral alignment. Because of this, I highly recommend watching both of Dr. Loth’s videos on his website. He will demonstrate with a model how your head and neck should look. Side sleepers should sleep on one of the two outer chambers of the pillow. These are raised and fuller, with more support for underneath your neck. Since you are at a different angle when you lay on your back, the middle chamber of the pillow is much thinner and it may take some getting used to when you move back and forth between the two positions (something I often do at night). It took about 2-3 nights with some filling adjustment to finally feel that my head, neck, and spine had acclimated to the pillow. I had no issues with strain, tension or headaches and I think the pillow did a good job of supporting my neck properly. The outer cover is textured and soft thanks to the breathable Tencel fabric – but you may want to put a pillow cover over it if the texture bothers you. If you are someone who just can’t seem to get comfortable with a traditional pillow I think it would be worth trying out the SpineAlign. With some patience and willingness to manipulate the pillow until it’s in the correct position for you, I think this could really benefit back and side sleepers. Those who are hesitant about the price should consider the 90-day trial period, but be aware that you will have to pay the cost of shipping and handling.